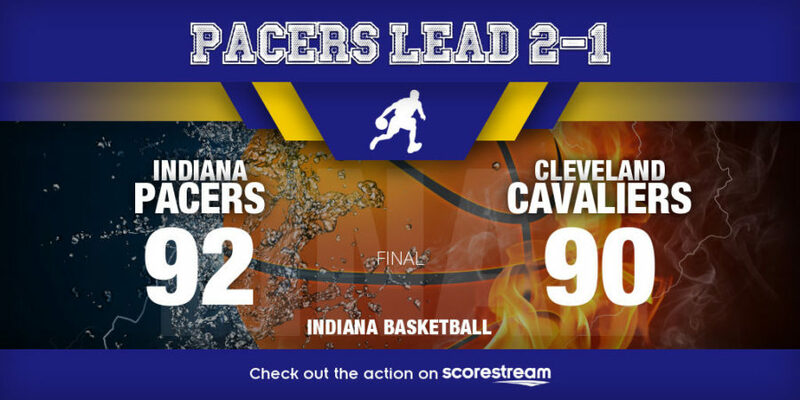 INDIANAPOLIS — Bojan Bogdanovic scored 30 points, and the Indiana Pacers roared back from a 17-point deficit to secure a 92-90 victory over the Cleveland Cavaliers on Friday night to take a 2-1 lead in their NBA playoff first-round series. Bogdanovic, who scored 19 of his playoff career-high points in the second half, shot 11 of 15 from the field overall, including 7 for 9 from 3-pointer to lead the way for Indiana, which bounced back from the Game 2 defeat in Cleveland. Victor Oladipo added 18 points, six rebounds and seven assists, just shot just 5 of 15 from the field and had a team-high five turnovers. Thaddeus Young finished with 12 points, seven rebounds, three steals and two blocks for the Pacers, who were by 17 points at halftime, but outscored Cavs 52-33 in the second half to seal the comeback win. “Last year’s team, I don’t know if we would have gone down 17, I don’t know if we would have overcome it,” admitted Young. LeBron James had 28 points and hit four 3-pointers, to go with 12 rebounds, eight assists, but also turned the ball over six times for the Cavaliers, who were 39-0 during the regular season when leading after three quarters. “We were more aggressive in the first half. We had tempo, they didn’t,” James said. Kevin Love contributed 19 points and six rebounds and George Hill ended with 13 points for Cleveland, which got no production from Kyle Korver, who finished without a point in 20-minutes and went 0 for 3 from the floor. Game 4 in the best of seven-game series is Sunday again in Indianapolis.